Sonic Adventure - SUPER SONIC vs PERFECT CHAOS! The final match begins! Hold on to your socks coz J.Axer and SA take you on a wild ride for a one time only comic adventure you won't forget! Axer Industries with it's marvelous flare on the cover front, and SVT with it's inside pages doing what they do best...with Sonic and Chaos at it in a no holds barred melee like you remember it on your Dreamcast! 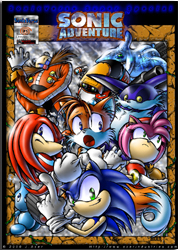 Also: Sonic Dimension is added to the specials section! Check that out as well, it's listed on the right here under "Back Issues".